If you are interested in reading other travel guides and photo diaries from different destinations too. 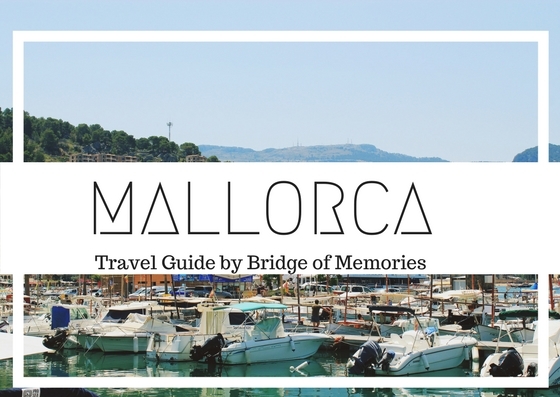 Share with us any tips on what to do, eat or see in Mallorca if you do have any too! Mallorca is one of the Spain's Balearic island in the Mediterranean. The capital city is Palma de Mallorca. However, it is easy to travel around the island through public transport or by hiring your own vehicle. The Cathedral in Palma, more commonly referred t as Le Seu is a Gothic Roman Catholic church located near in old city of Palma. This significant landmark of Mallorca is just next to a La Almudaina royal castle. Just in front of the park you have a great Parc de la Mar, where you can enjoy a walk with a view on cathedral in the whole or where majority of events and festivals are happening. A gothic style castle located on the west of Palma is worth to visit for a mesmerizing view over the harbour and the city. The castle was built in the 14th century for King James II of Majorca and the significant features of this castle is its valleys and it is one of the few circular castles in Europe. Banys arabs is actually a pretty place surrounded by a nice garden. Arab baths, dating from the 10th to 12th centuries are the only remaining monument to the Muslim population on the island. Although, the only thing that has survived are two small underground chambers, it is a still pretty visit. There is €2.50 entrance fee to the Arab baths and gardens. Mallorca has many cycle paths as well as trails for passionate cyclists. Explore various cycling trails, whether it is a leisure cycling or demanding cycling, all on See Mallorca website. To avoid disappointments, it might be good idea to check and book in advance, as cycling in Mallorca is a very popular activity. Mallorca is an island and you will find many pretty scenery and beaches any direction you go. Palma beach or Major Playa are the neariest beaches if you are staying in Palma de Mallorca. Apart from those, Magalug is a popular destination if you are looking for night life or head to Playa de Muro to enjoy 6-miles of sandy beach. La Lonja in Palma is the former maritime trade exchange, an area of Mallorca known as the old city is a great place to go after dark. The vibrant area is great for dining, bars or clubs. This area is considered the nightlife destination of Palma de Mallorca. Soller is a popular destination for day tripping, especially if you are travelling from Palma by a wooden train. Soller is located in the valley of oranges and lemons surrounded by mountains. It takes only an hour to get there and the tickets cost approximately €32 two ways. If you wish to continue, there is another train towards a small village Port de Soller. Banyalbufar is a pretty coastal hilly village on the west of Mallorca. This small village is a significant by one thing, its terraced hillsides sloping down to the sea. Serra de Tramuntana is a UNESCO heritage site, it is a mountain range from southwest to northeast forming the backbone of the island. If you are seeking for nature, scenery and some hiking, definitely plan a trip around this part of Mallorca. To get to Cap de Formentor, you have to ride on a scary roud, but it is worth to get to the northery point of Mallorca to enjoy the stunning view 400m above the sea. How to get around Mallorca? We have stayed majority of our time in Palma de Mallorca. Thus we have walked around the city. However, Mallorca have some great bus connections to different parts of the island and it is easy to commute if you wish to go to beach or visit a different town. Visit their transportation website to check your routes. As I have already mentioned, Mallorca has a cute antic wooden train which runs to Soller city and back. If you would like to spice up your journey a bit, take a ride on the wooden train while you are admiring the scenery during the way. Where to eat and drink in Palma de Mallorca? Where to shop in Palma de Mallorca? If you are landing in Palma, it is easy to take bus number 1 which will go to Palma city. The cost of the tickets one way is €5 and takes up to half an hour to get there from Palma. During our longer weekend getaway Mallorca, we have booked our lovely cute apartment through Airbnb. Book your next stay wherever through this Airbnb link to get £13 off your first booking.